Attention all pool players! CRG wants you! Who wants to play some pool? We do, CRG Nation, and we want you to play! 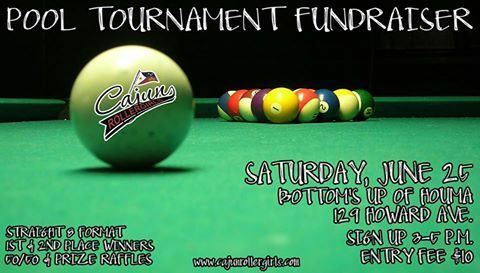 We’re hosting a pool tournament fundraiser event on Saturday, June 25, at our awesome sponsor, Bottoms Up Of Houma LLC! Entry fee is $10 for this straight-8 format tourney. First and second place will win prizes, and we’ll also have a 50/50 raffle and other prize raffles! Won’t you come and join us? Let us know that you’ll be there by RSVPing at our Facebook event page! Come and get your ride washed by CRG! Happy Father’s Day!